I sort of have a love/hate relationship with health insurance. I love it when it actually does something to help us (which is rare…but we have had a few times when it has actually paid for something). I don’t love it during all the times that it doesn’t do anything (except take our money for premiums…and then not cover anything) Grr. Now that we’ve started using more natural health options, our health insurance really doesn’t seem to be worth having. Insurance companies tend to freak out when you use the word “natural.” Yikes! We’ve started looking into Christian Healthcare Ministries. With this program, the money we pay each month actually goes directly to another family with medical bills. If we were ever in need, this organization would help us directly, thanks to the sharing of other Christian families. We love that concept, and it just seems to make so much sense. Christians helping Christians. Love it. So, I’m wondering…what experiences do all of you have with health insurance…or alternative ideas like Christian Healthcare Ministries? What are your thoughts on how we as Christians should best be using our money in this area? Share with me your ideas and opinions!!! It’s been a few years since I originally wrote this post. Since then, we jumped aboard with Christian Healthcare Ministries and haven’t looked back. We’ve saved thousands of dollars every year using this. They’ve met our needs fully. They have been wonderful to work with through medical issues we’ve had. My favorite: They didn’t worry about pre-existing conditions. I highly recommend you look into this for your family! Our family of six pays only $135/month for Bronze Coverage. That is perfect for our family since we choose alternative medicine if at all possible. 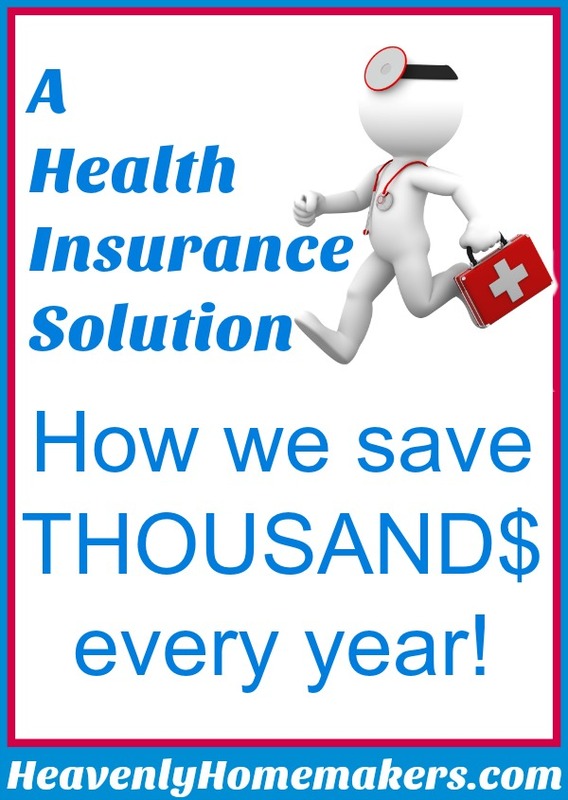 Instead of paying high monthly premiums that cover nothing for our family, we pay a very low monthly premium and put money in savings to cover a deductible if we need it and to cover our chiropractor or natural doctor bills as needed. With the cost of health insurance rising, the coverage getting worse, and the frustration mounting – look into Christian Healthcare Ministries. We are so thankful God has provided this! A great way to tithe. This sounds similar to Christian Care MediShare, which my inlaws use. They love it! We’ve been struggling with the health insurance question too. It is SO expensive and wouldn’t cover my homebirth. Thanks for the link. I totally understand your dilema. You pay every month and then get next to nothing in return. Another option is major medical coverage. I don’t know a lot about it, but I know a few families that have it. Ooo! Tough subject. Here is what just happened to us though. We have insurance with a VERY high deductible–$10,000. Kind of an “emergency” only policy, if you will. Then, I had a detached retina scare–almost went blind. Very scary. And of course, HUGE deductible. HOWEVER, they negotiated the price down from $7000. to under $2000!!! HUGE. I can’t tell how this saved us and how bad I felt for every one who gets suckered and has to pay the full price. Nasty stuff. So, while they didn’t pay a dime, I was glad to have the “coverage”. As far as the Samaritan deal, we looked into that a couple of years ago and found that if you have ANY pre-existing condition, you can forget it. I had a thyroid issue, so they would not accept me. But, for the totally healthy, I’d say it might be a good thing! I had friends who literally paid $200 to have a baby–in the hospital–with it. Health insurance can be so frustrating- we own our own business and buy our own individual coverage, and likewise have a $5100 deductible and no maternity coverage whatsoever. We’ve looked at this idea before, but not indepth…I’d love to know what you all decide and if you go with it, how it works for you! Best wishes! It’s not true that Samaritan Ministries wouldn’t accept someone with a thyroid problem. Samaritan does not turn anyone down for health reasons. For practical reasons, bills related to pre-existing conditions aren’t shared among the members as regular needs–but even bills that occur before membership can be shared as special prayer needs and our members get quite a bit of real help in those areas. We are working on several options to help Christians with pre-existing conditions, but with limited resources our options are fewer. I have been a part of Samaritan since 1996 as a member and been on staff since 1999, and I wouldn’t want to do anything else for my health care needs. Even having chronic asthma, which I pay the bills for out of pocket, the total monthly cost for my family is a fraction of what most people pay for insurance. Added to this (and especially this!) the prayer and encouragement that comes with a need in the forms of notes and cards is simply amazing. To know that people all over the country are praying for you is a great encouragement–something that will never come with an insurance company. There are health care sharing ministries that refuse membership to people who have pre-existing conditions, but Samaritan Ministries has never refused membership to anyone based on health and will continue that practice. We use a similar group, Christian Care MediShare, and have had a good experience. It only will cover the ‘big stuff,’ which is what we wouldn’t be able to afford. It does have a thorough screening process for pre-existing conditions. It has good maternity coverage, which is all we’ve needed it for so far. For our last baby (in a hospital), I don’t think we paid a thing. I’ve also heard people talk about bringing down hospital bills yourself, that most are willing to negotiate if you’re ready to pay in cash right then. My mom recently had a strange skin condition – she didn’t know what it was. She suffered for around 3 years, and finally they opted for the best insurance policy available under my dad’s job. Then she got better (not sure why!) but around that time, my dad got cancer and had what would have been very expensive proton therapy with a huge deductible, had they not had the top of the line insurance. We think it’s providential that they changed their insurance to be more comprehensive before his diagnosis! samaritan ministries covered all the bills that we sent in with our first child. We like the program even though sometimes it seems like we are paying a lot a month(it varies with how many children you have). For maternity if you have only been on for a certain amount of time they only pay a certain amount. There also is no deductible that we have to pay first and we really like that. So I had a question – this posting is almost a year old… What did you decide to do? And has it worked for you? My hubby and I both work outside the home, and love it, altho, in 7 days I’ll be working from home! I have him on my insurance, since it’s the best insurance. No deductible, no copays etc. When you have kids who go to the dr’s for check-ups, shots etc it all adds up! I think these organizations are a wonderful option for some. Unfortunately, we absolutely have to have health insurance to cover my husbands autoimmune disease. Yes, he does do natural things to help, but no, we cannot give up the meds he takes. He would die. He takes thousands of dollars worth of meds a month. I am glad that organizations like the one you mentions are available for those that can use them. I know they are a blessing to many. Yes! My friends are in the same boat as you because he must take expensive meds every day to stay alive. It’s so hard on them financially, but better than it would be without this insurance, so they stick with it!